[S1352] Michael J. Madden, Illinois Coroner's Certificate of Death, Family History Library, Salt Lake City, Utah, MF# 1927010. [S1760] Chicago Daily News, June 29, 1936, page 29. [S1065] Illinois Statewide Marriage Index (1763-1900), Mary A. McNulty and Michael J. Madden, married Oct 18, 1889, Lic # 299320. [S2247] Illinois, Cook County Deaths, online www.familysearch.org, Cecille K. Heidkamp, 30 Jan 1976. Accessed March 3, 2019, FamilySearch.org. Cert. number 602592. 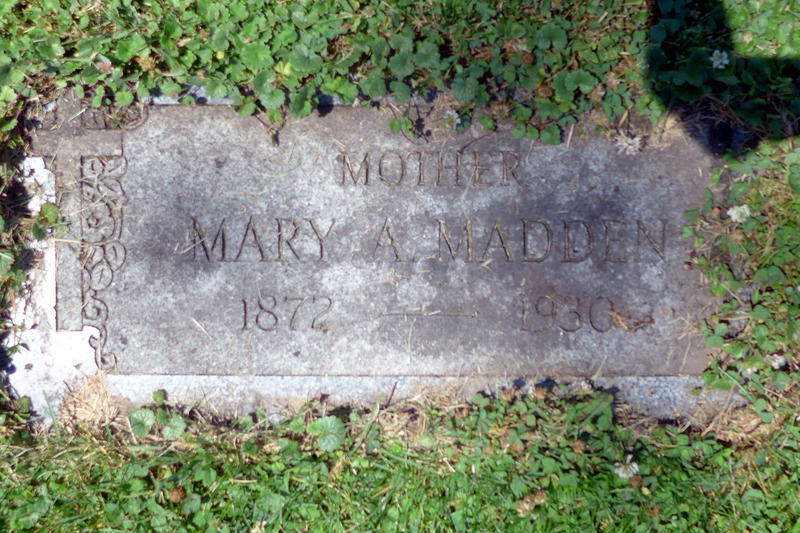 [S2507] Mary Madden Cemetery marker, All Saints Cemetery, Des Plaines, Illinois. Married Name: Her married name was Deal. Marriage*: She married Henry M. Deal. [S589] Mary McNurney Deal, Illinois certificate of death, Family History Library, MF# 1892491. [S190] Chicago Tribune, June 14, 1930. [S589] Mary McNurney Deal, Illinois certificate of death. [S1674] The Journal Times, October 27, 1977, page 6A, Accessed October 14, 2012, NewspaperArchives.com. [S1709] Chicago Tribune, May 1, 2009, page 35. [S1863] Dana McSweeney Roberts, "McIntyre-Sullivan Family History," e-mail to Elaine McIntyre Beaudoin, December 8, 2013. [S309] US Social Security Death Index, 1935-Current, Ancestry.com, Robert M. McSweeny entry, accessed December 8, 2013. [S665] Elaine Beaudoin's personal knowledge Elaine McIntyre Beaudoin, personal files, Telephone converstation with Bob Sullivan, December, 2012. [S2243] Paula Calderon, Birth registration: Sacacoyo, La Libertat, El Salvador, Accessed August, 2015; images provided by Marina McIntyre. FHL MF#1159173. (June 30 1887). [S1106] The Fresno Bee, August 11, 1964, page 12A. [S1117] Barbara Jean Metzler, California birth certificate no. 891, Family History Library, Salt Lake City, Utah, MF#1876523 (December 15, 1938). [S1118] Fresno County, Superior Court Petition for Citizenship, no. 4232, Family History Library, MF#1666770, from material at the American Historical Society of Germans from Russia, Fresno, California (May 6, 1935), California. [S1240] Germany Marriages, 1558-1929, online FamilySearch.org, FamilySearch.org, Dreimueller-Blum Marriage, MF#559037, accessed October 11, 2010. [S1258] Germany Births and Baptisms, 1558-1898, online FamilySearch.org, Family History Library, MF# 560650, Katholische Kirche Üxheim-Ahütte, John Christopher birth record, Accessed October 11, 2010. [S1258] Germany Births and Baptisms, 1558-1898, online FamilySearch.org, Family History Library, MF# 560650, Katholische Kirche Üxheim-Ahütte, John Dreimueller birth record, Accessed October 11, 2010. [S1258] Germany Births and Baptisms, 1558-1898, online FamilySearch.org, Family History Library, MF# 560650, Katholische Kirche Üxheim-Ahütte, John birth record, Accessed October 11, 2010. [S1258] Germany Births and Baptisms, 1558-1898, online FamilySearch.org, Family History Library, MF# 560650, Katholische Kirche Üxheim-Ahütte, Peter Joseph Dreimueller birth record, Accessed October 11, 2010. [S1258] Germany Births and Baptisms, 1558-1898, online FamilySearch.org, Family History Library, MF# 560650, Katholische Kirche Üxheim-Ahütte, Maria Anna Dreimueller birth record, Accessed October 11, 2010. Birth*: Anne Monaghan was born; There are no births for an Anne Monaghan/Monohan born after 1864 in Cavan, County Cavan on irishgenealogy.ie. [S2481] Sinead Donnelly, "Re: My Heritage Family Tree," e-mail to Elaine Beaudoin, Aoril 9, 2017. [S2510] Michael Donohoe and Mary Monaghan Marriage record: Copy of reccord provided by Sinead Donnelly, July 15, 2017. Census 1911*: Mary Monohan and Michael Donohoe appeared on the 1911 census of 1911 at Denmore, Denn, County Cavan, Ireland; The same Rose Monohan, now aged 26, is living with the family as was living with them in 1901. [S2454] Michele Cahill, "Thomas Cahill and Kathryn Teresa Sullivan Family Group Sheet", Provided to Elaine Beaudoin on March 10, 2017, Revised: March 20, 2017. [S2511] Katie Donohoe, Ireland, County Cavan, Bellananagh, Denmore Page one, entry 140, #01750565, Accessed July 17, 2017 (July 12, 1907). [S2650] 1901 Irish Census, County Cavan, Denn, Denmore, Dublin, Form A; No. on Form B. 18, Accessed March 9, 2018. [S2648] John Donohoe, Ireland, County Cavan, Cavan, Denmore birth registration Page 61, line 343; ID# 01859630, Accessed March 9, 2018 (Sep 29, 1893). [S2649] Mary Anne Donohoe, Ireland, County Cavan, Cavan, Denmore birth registration Page 69, line 96; ID# 01825629, Accessed March 9, 2018 (Mar 27, 1896). [S2645] 1911 Ireland, County Cavan, Denn, Dennmore, Dublin, Form A, Accessed March 8, 2018. [S2645] 1911 Ireland, County Cavan, Denn, Dennmore, Dublin, Form A, Accessed March 9, 2018. [S2522] Interview, Teresa Sullivan Cahill, August 22, 2017, He was given the name because he was a great dancer. [S2756] Mary Donohoe, County Cavan, Bellananagh death registration, Accessed January 31, 2019. [S2652] Thomas Donohoe, Ireland, County Cavan, Cavan, Denmore birth registration Page 74, line 287; ID# 01942564, Accessed March 9, 2018 (September 30, 1887).